Tech startups in solar just got the opportunity to show off their development and research. 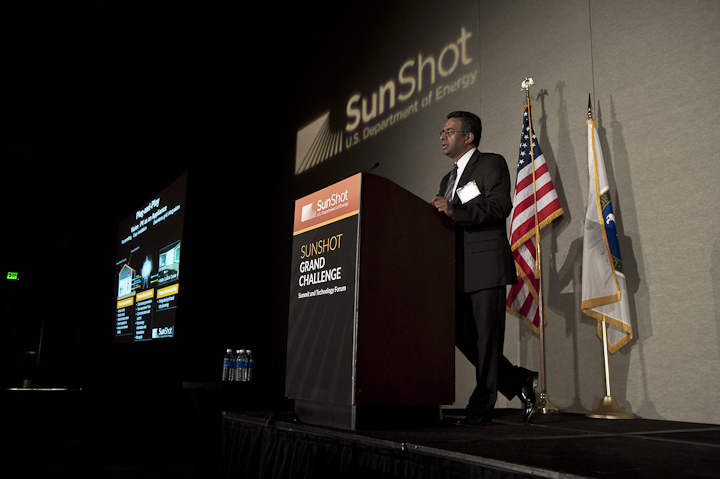 Forbes reported on the U.S. Department of Energy’s Sunshot Initiative competition, in which 17 teams that gave 8-minute pitches about services to make solar power installation easier. According to Forbes, the solar market needs IT improvements yesterday. Part of this is because sales people need a basic solar energy system design that’s not only functional, but efficient enough that they can offer a fair quote to consumers. However, the software that’s used isn’t always the same as the software used by the engineers to design the solar system that’s being installed. As a result, the price of the final product could vary a lot between what was originally quoted. Enter the Sunshot Initiative program, which “aims to drive down the average wholesale price of solar electricity to $0.06 per kilowatt-hour by 2020,” says Forbes. SunShot has funded over 350 projects since 2011, and this competition (called Catalyst) is designed to promote market innovations quickly. Of the 17 teams, technology ranged from software to creating IT solutions for solar. The PVComplete team built a software design tool that allows solar installers, along with roofers and contractors, to create their own designs. Given that the kind of solar energy system a consumer might want isn’t always compatible with what an engineer design, this tool would let sales people who don’t know AutoCAD create a design engineers can complete. Savenia Solar Ratings is the “CarFax of solar,” with an online system that determines the value of a solar energy system based on a rating system. What makes this tool so great is it has crossover appeal for homeowners that want to figure out prices to contractors that need to offer quotes to potential customers. There are free yet unofficial rates, but official, verified ratings cost. Gridmates, whose app converts your energy amount into a dollar amount, focuses on donating energy to people in need worldwide. You donate energy, and it then sends the money that equals that energy amount to someone or a nonprofit organization to pay utility bills. The way Gridmates would make money is by profit sharing with utilities, charging nonprofits a fee to use the app as a fundraising tool, or from companies’ social responsibility programs. Solar Site Design developed software for coordinating the sales, design and engineering process. First, they train sales people to use the program to gather data from potential consumers and create rough designs of their solar systems. Once the designs are reviewed, they’re entered into a database that can be shared with companies who can finish and install the system. They’ve already begun delivering projects to SunEdison in the past year. UtilityAPI works on obtaining billing information, like energy consumption, via software that automates the process by using API Adapters that extract billing history from a computer. This way, sales people could get data online after getting consumer’s permission and figure out how much energy they actually use (and thus need with a solar system). This archive can also collect information that shows the amount of energy that’s used — or saved — once rooftop panels have been installed. Congrats to all the winners and teams that participated! It’s exciting to see this many solar startups making a mark. What do you think of the winning companies? Tell us in the comments!